I wanted the base to fit the look of my army’s overall basing scheme, obviously. So it was clear that I would use the same rock/rubble look. I wanted the base to look interesting enough to do the model justice, but not so impressive as to draw away attention from it. 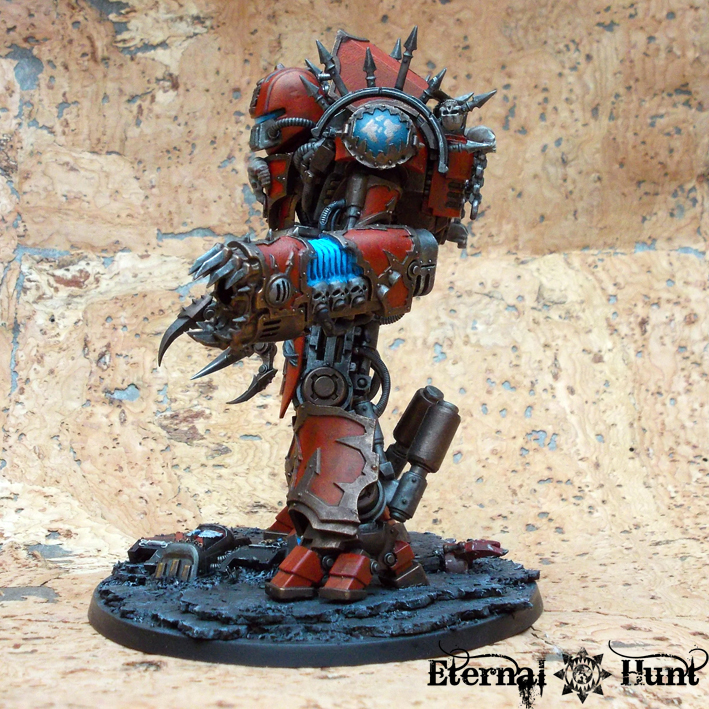 it would be really cool if the base could feature a fallen enemy of the Wargrinder. So with these ideas in mind, I started to mess around with a couple of ideas. I obviously used the usual recipe of big and small pieces of cork plus some modelling sand and slate to represent the rocky ground and debris. Yet what about the fallen enemy? Covering the base in skulls would certainly have seemed slightly goofy, since the Wargrinder doesn’t have any obvious way of harvesting skulls in the traditional sense, due to its enormous size. So it had to be a bigger enemy, preferredly one with a certain reputation when it came to ferocity in combat. I didn’t have a whole Dreadnought to spare, of course, so I wanpushed into the earth under theted its remains to look half buried, probably flattened and trampled underfoot. 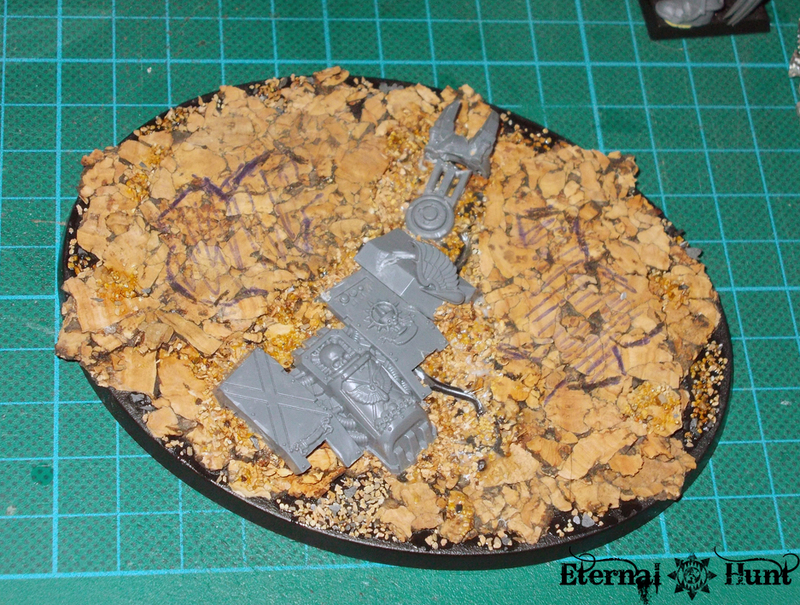 In order to achieve this effect, I covered the middle of the base in a mix of wood glue, modelling sand and cork chaff. After the material had been evenly distributed, I added the torso front on top. 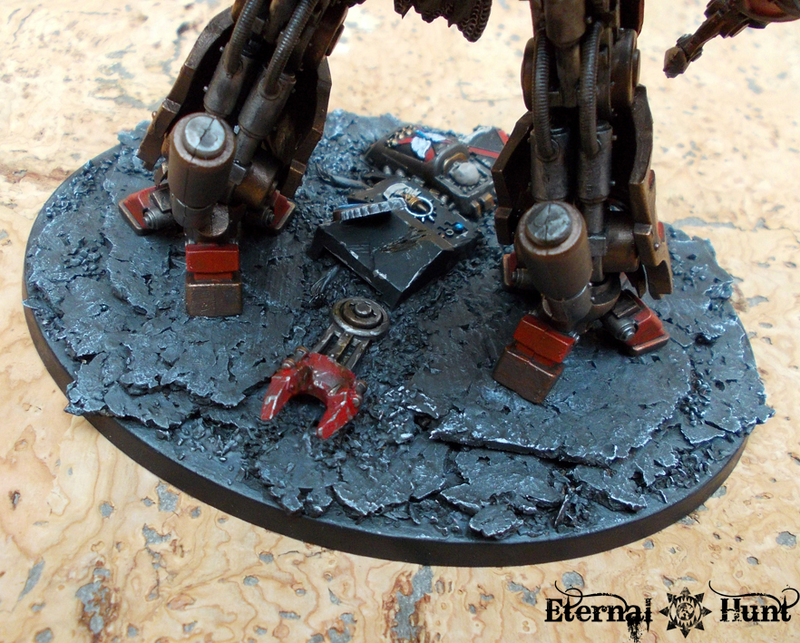 I also built the remains of a torn off arm from a Dreadnought fist and a hydraulic strut from the Dreadknight. Then I added more sand and cork on top to blend everything together. And if you take a closer look, you can see some actual cables, representing the torn cabling emerging from the Dreadnought’s destroyed torso. And you may even spot the areas where I used a pen to sketch the outlines of the Wargrinder’s feet in order to make sure everything would fit together in the end. I am reasonably pleased with the result: The fallen machine clearly reads as a Death Company Dread, and it adds a nice visual flourish to the base without the thread of overpowering the actual model. So the last step was to actually glue the Wargrinder to the base, and it was with slightly shaky hands that I completed this last task. The Wargrinder towering over its fallen foe. 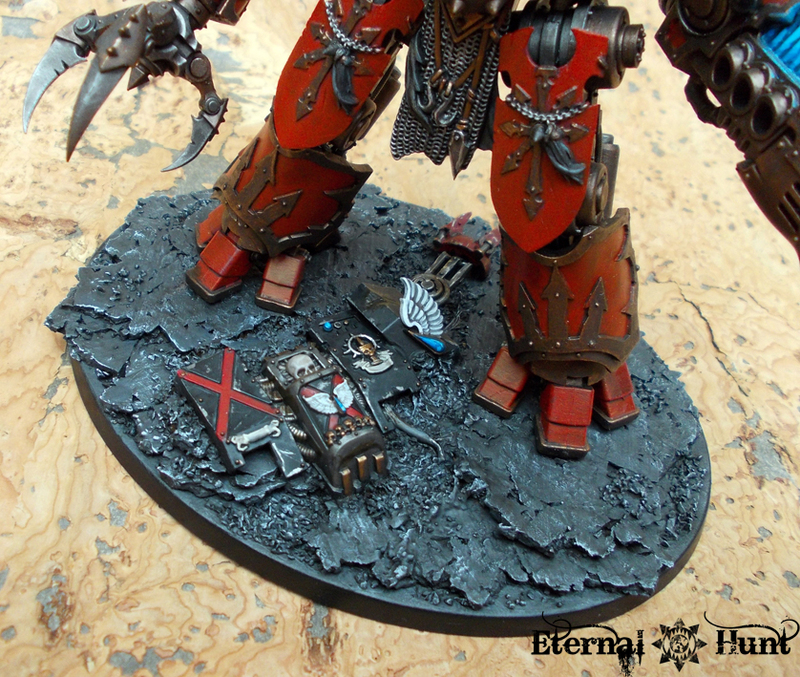 By the way, PDH found the perfect excuse for the icon of Khorne on the model’s back being the wrong way around: “It’s for when Khorne’s looking down on him.” — yes, that’s a brilliant explanation, and much better than admitting that I didn’t pay enough attention, so let’s just go with that! 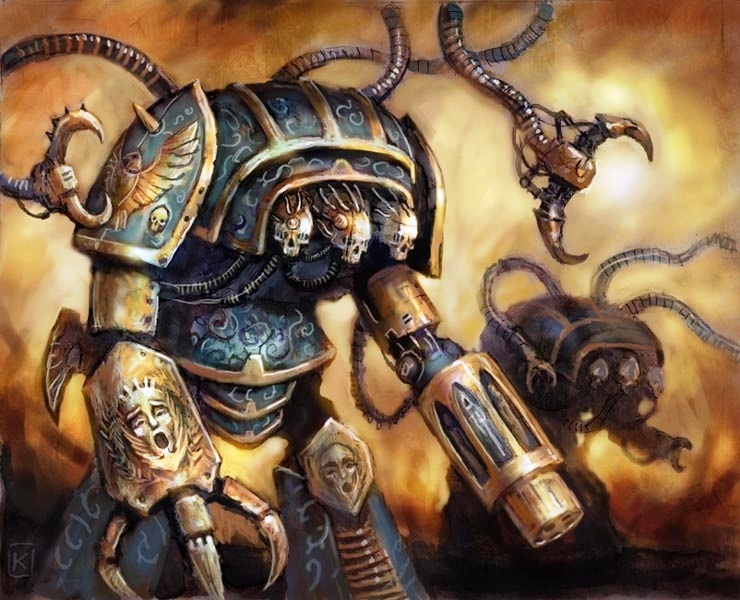 For me, the head really helps trace a lineage back to the Legion Maniple robots, one that was dragged with your guys into the warp, and is still serving millenia later. 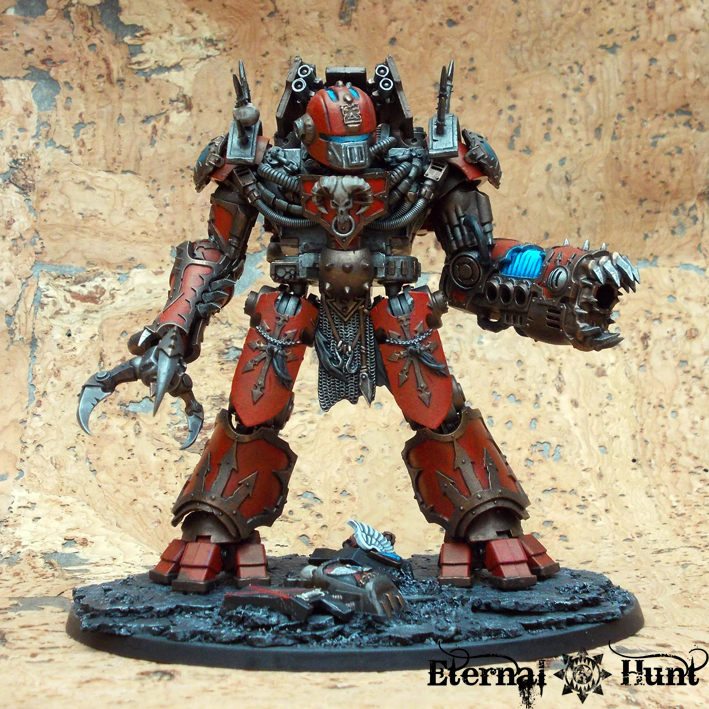 While I didn’t have it all worked out like that from the start, my plan for the model was that the Wargrinder is neither a dreadnought-like sarcophagus for the remains of an Astartes, nor a daemon’s spirit given metallic form. 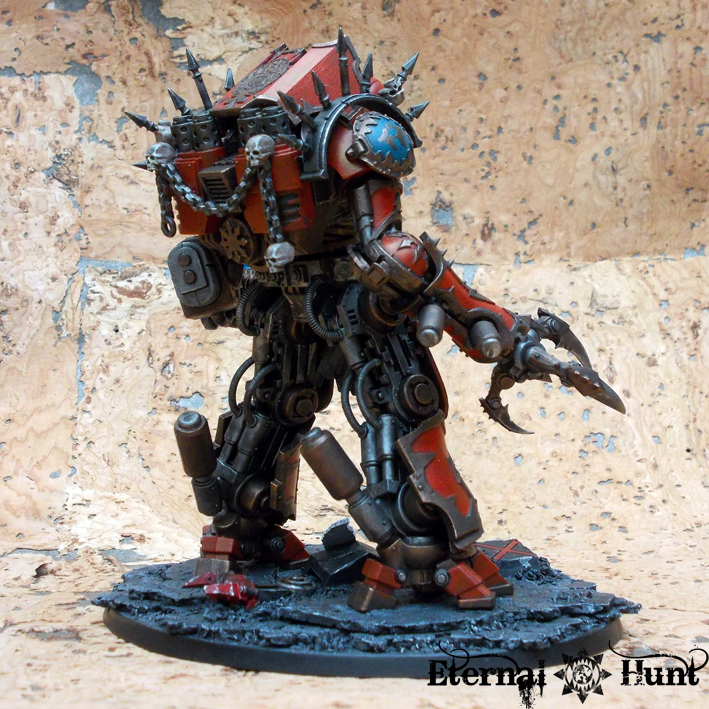 Rather, it is actually supposed to be an enhanced and somewhat redesigned Legio Cybernetica robot (as a matter of fact, even though I only disvovered this after the fact, it does bear some structural similarities to the Lambda Zeta-01 Combat Class Robot): Maybe it has been serving the 4th assault company ever since the Heresy, and Warpsmith Deracin just made some additions and alterations to the machine. 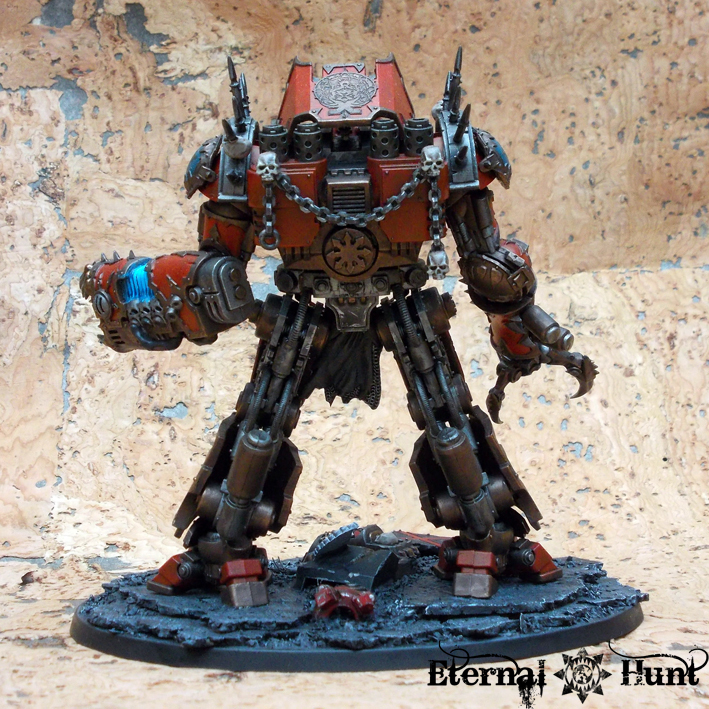 Maybe it has been constructed by Deracin himself, using the remains of Mechanicus warmachines and the dark secrets of his craft. In any case, the machine isn’t a frenzied daemon, but rather an emotionless, uncaring killing machine. And I think the head I chose is a better representation of that than any frenzied daemon face. That said, it’s certainly purely a matter of taste, and I acknowledge that not everyone will like my choice. I am certainly not making excuses, just trying to explain my reasoning on this. 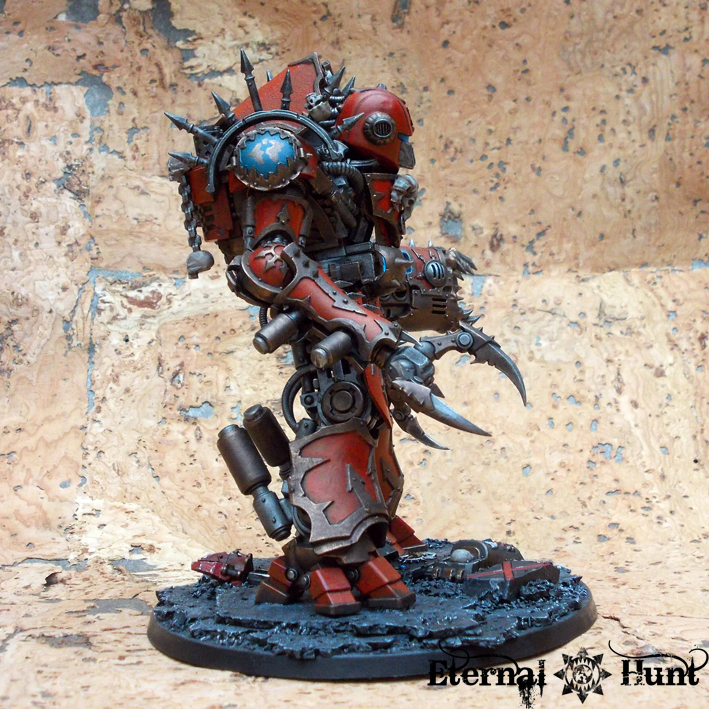 For those who really cannot stomach the head, I’ll happily point you towards Chris’ Dreadknight conversion once again. It uses a Necrosphinx head and looks awesome! So yeah, that’s the finished model in all its glory. But what will I ever use it for? To be perfectly honest, I mainly started this project due to the prospect of being able to convert and paint an awesome model. Still, there are a number of possible in-game uses for the Wargrinder, of course: The most obvious choice would be to use it as a Decimator. The size of the model is similar, and using it in that capacity would be a great way of having access to a Decimator without having to get the “official” model, The small problem here is the WYSIWYG rule: The base is quite a bit bigger than the Decimator’s standard base — and I simply refused to glue the Wargrinder to a smaller base, because that could have looked rather ridiculous. Still, while I didn’t try to model for advantage, the fact remains that the bigger base may make things ever so slightly easier for me 😉 The other problem is the model’s weapon: I just used the leftover Forgefiend weapon because I liked the look of it, but it doesn’t really represent either equipment choice available to a Decimator all that well. Still, with a little goodwill on my opponent’s part, the Wargrinder would certainly make for a pretty cool counts as Decimator. 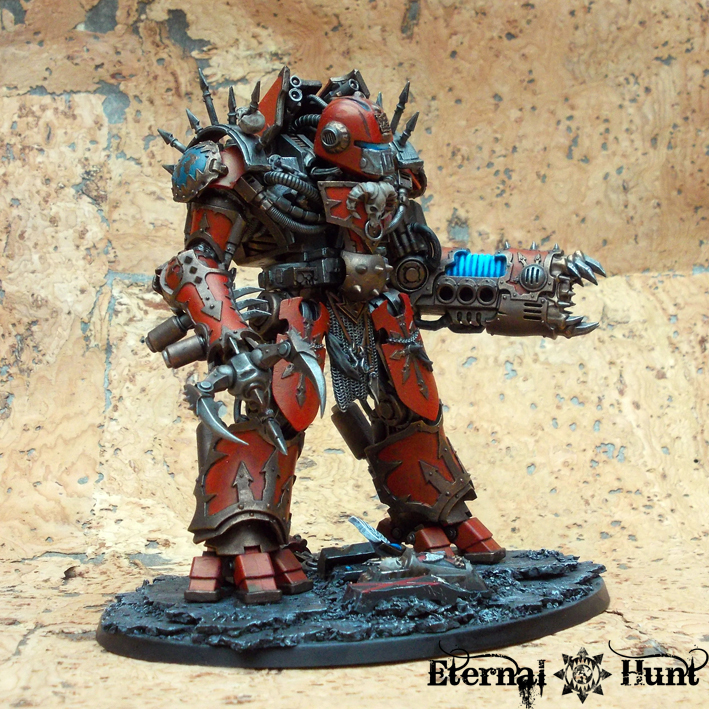 It could also be used as a counts as Forgefiend, Maulerfiend or even Defiler, come to think of it. Sure, each of these options will once again require an understanding opponent, but the bottom line remains the same: Even though my main objective was to build and paint a badass-looking model, the Wargrinder could very well come in handy on the table as well! 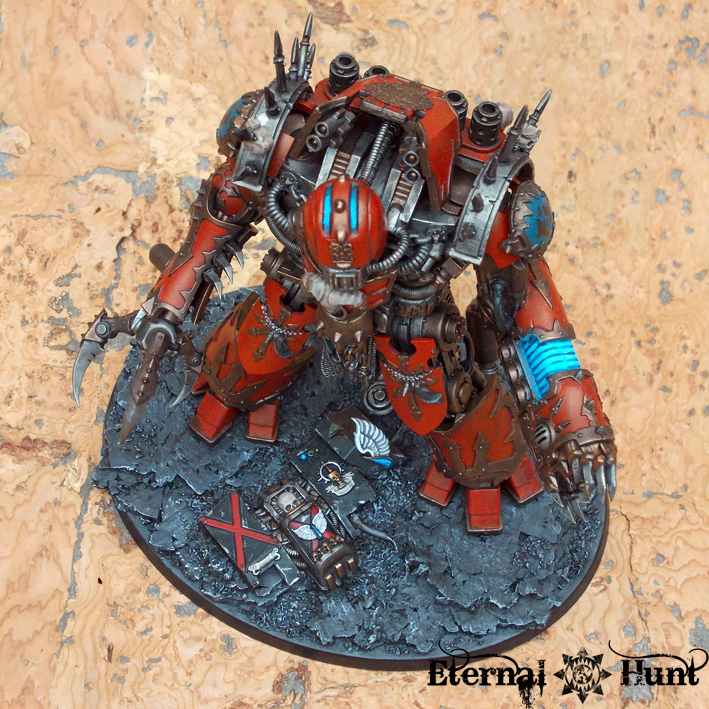 The warmachine designated Wargrinder by the legionaries of the 4th assault company is certainly a terrifying testament to Huntmaster Deracin’s dark genius. 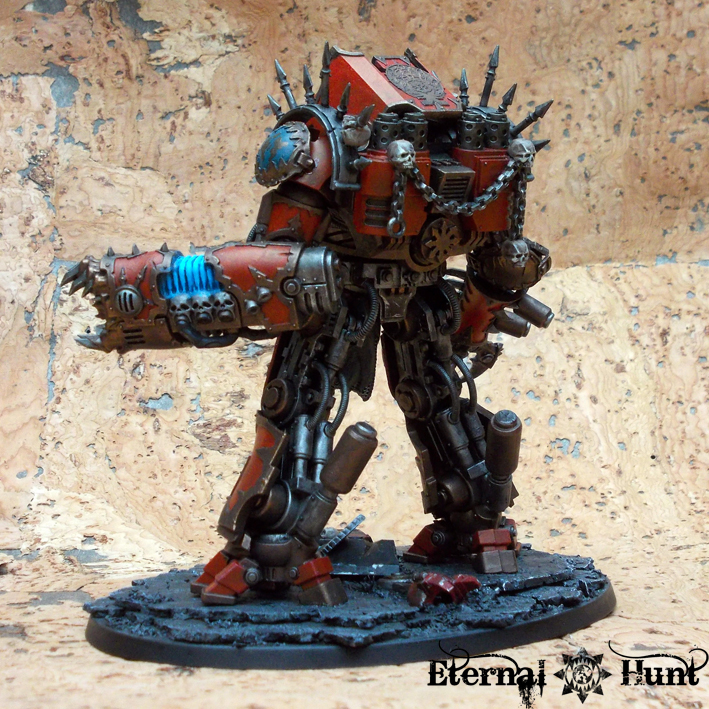 Bigger even than the fearsome Contemptor, the Wargrinder usually towers over the battlefield, a metallic embodiment of murderous intent. 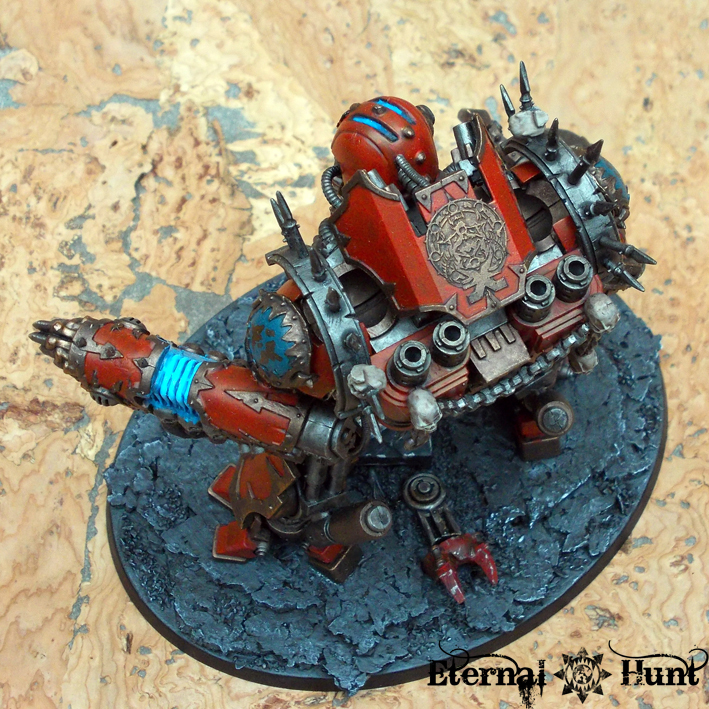 Based on the ancient and hallowed warmachines of the Legio Cybernetica that fought alongside the XIIth Astartes Legion during the Great Crusade and subsequent Horus Heresy, the Wargrinder has evolved into something altogether different: While there are still enough hints as to its origin, the machine’s armoured bulk now resembles nothing so much as the form of a traitor Astartes, its baroque armour plating and daemonic weapons a clear indicator of its allegiance. and its fluid, almost organic, movements terrifying to behold. 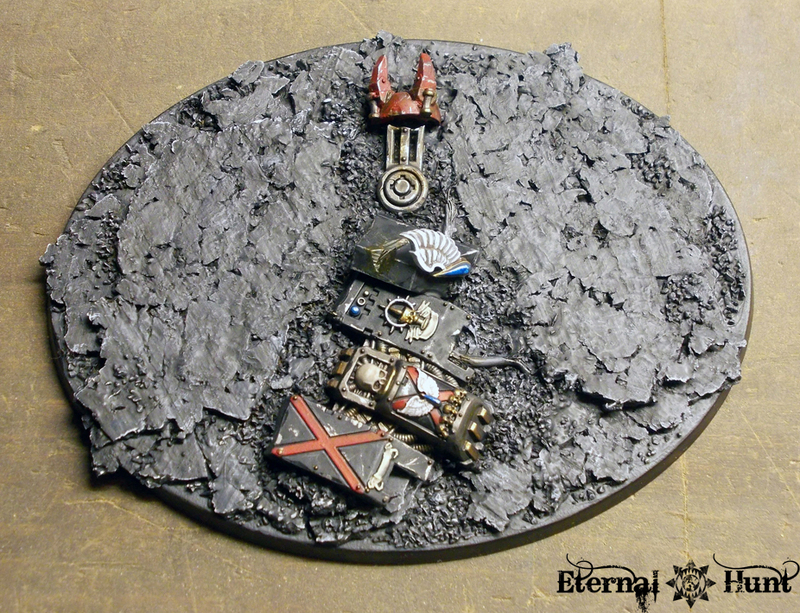 While the Wargrinder is infused with the energies of the warp, it remains a machine: In eerie contrast to the frenzied and bloodthirsty traitor Astartes fighting alongside it, the daemon engine’s relentless advance betrays the precision of an automaton: A Wargrinder never tires, never retreats, until its task is done. 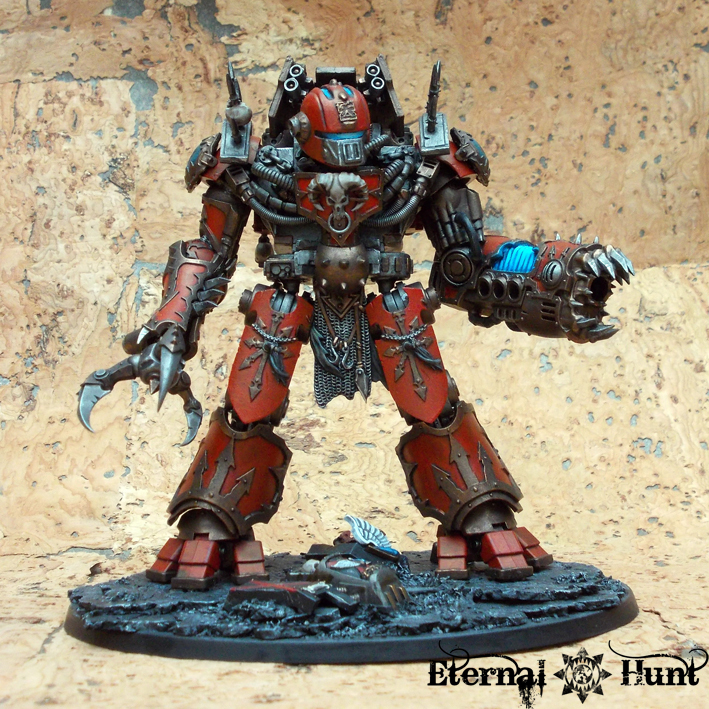 But where an organic follower of Khorne would leave himself be consumed by his instinct and his rage, it remains emotionless and calculating, its behavioral protocols ensuring its murderous efficiency. So there you have it: I hope this little series about building and painting the Wargrinder has been interesting to pursue! As always, feel free to let me know what you think in the comments! I’d love to hear from you! And, of course, thanks for looking and stay tuned for more! 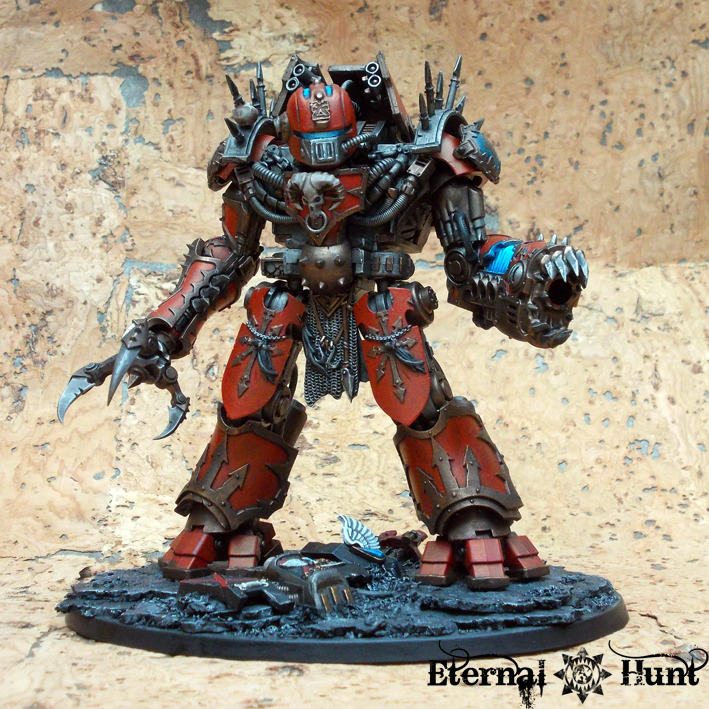 This entry was posted on September 6, 2013 at 09:00 and is filed under 40k, Chaos, Conversions, Fluff, paintjob, World Eaters with tags 40k, background, base, basing, blood knight, chaos, chaos space marines, conversion, counts as, daemon engine, decimator, dreadknight, fluff, khorne, khorne's eternal hunt, legio cybernetica, paintjob, wargrinder, world eaters. You can follow any responses to this entry through the RSS 2.0 feed. You can leave a response, or trackback from your own site. 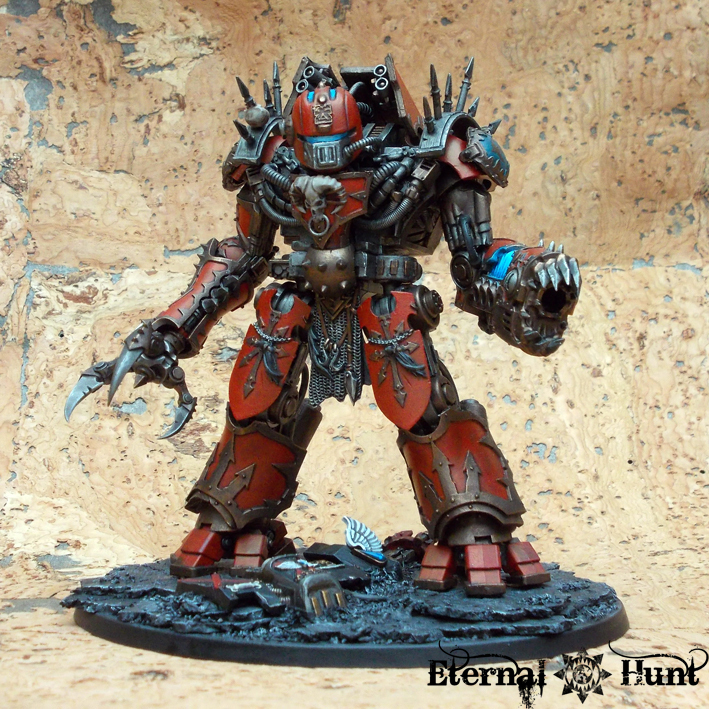 You should have shown more respect for the dedicated followers of Khorne that are the Blood Angel… They’re not chaotic? hummm oh well, I just forgot..
Really hope you find a good use for this guy, Hes way too cool to just sit there! Hi ! I was just passing by, looking for your nice article on SM release, looking for some advices on posing plastic models. Quite an interesting article I have to say. But I HAD to leave a comment when I saw this engine of destruction page. First of all : it is fantastic! 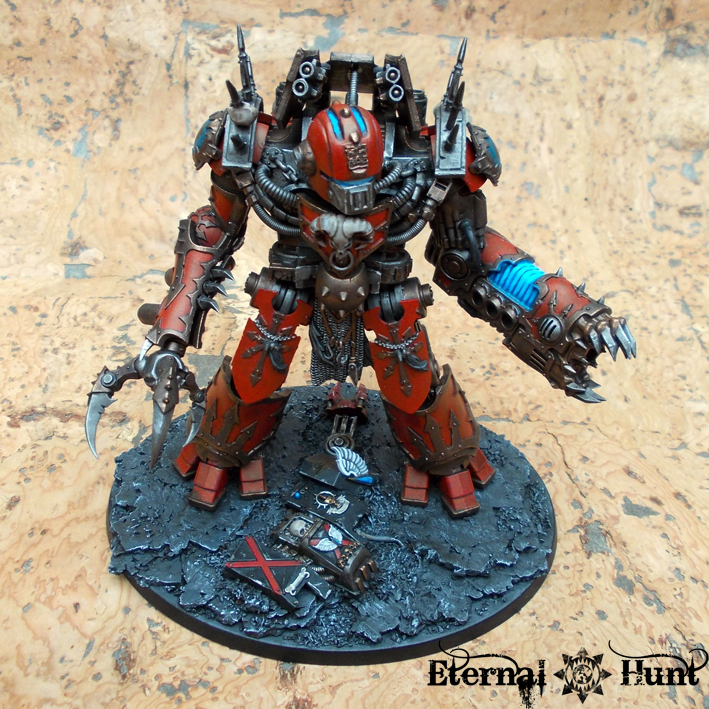 It is so great to see people able to take part from several GW kit and do something totally new yet in perfect adequation with 40K lore (by my point of view I would gladely buy this if GW offered the same kit). Congratulations and thanks, it is a very inspiring work for me, it lets me dream one day I should be able to do something worth posting. One single commentary still: I do not like the head, it is not chaotic/scary enough to me. I would have prefered a more “organic intricated technology” stuff. The rest I am totally found of it (these arms…). Cheers !